Metrorail, colloquially called the Metro, is the heavy rail rapid transit system of Miami and Miami-Dade County in the U.S. state of Florida. Metrorail is operated by Miami-Dade Transit (MDT), a departmental agency of Miami-Dade County. Opened in 1984, it is Florida's only rapid transit metro system, and is currently composed of two lines of 23 stations on 24.4 miles (39.3 km) of standard gauge track. Metrorail serves the urban core of Miami, connecting the urban centers of Miami International Airport, the Civic Center, Downtown Miami, and Brickell with the northern developed neighborhoods of Hialeah and Medley to the northwest, and to suburban The Roads, Coconut Grove, Coral Gables, and South Miami, ending at urban Dadeland in Kendall. Metrorail connects to the Metromover in Downtown, which provides metro service to the entirety of Downtown and Brickell. Additionally, it connects to South Florida's commuter rail system at Tri-Rail station, as well as Metrobus routes at all stations. Together with Metromover, the system has seen steady ridership growth per annum, with an average of 105,500 daily passengers in 2013. In 2012, Metrorail opened its 23rd station, Miami International Airport station, at Miami International Airport (MIA), opening a newly created 16-station Orange Line between the MIA and Dadeland South stations. The new line is expected to increase ridership significantly, adding millions of riders per year, and allowing residents and visitors alike direct access from the MIA to Downtown Miami, and greater connectivity between various modes of transit throughout Miami-Dade County. Central station provides direct service to Amtrak inter-city rail services, Tri-Rail commuter rail, Greyhound Lines intercity bus, and the Rental Car Center. Miami Central Station is expected to attract 150,000 daily commuters and travelers. In 1971, the Miami Urban Area Transportation Study completed by the Dade County metropolitan planning organization recommended the construction for a rapid transit system for Greater Miami. Having experienced a prolonged post-World War II population boom, metropolitan Dade County's permanent population rose by 35% to nearly 1.3 million residents within a decade, among the fastest population growth rates in the United States. Within a year of the study, county residents approved a $132.5 million ($793.6 million, adjusted for current inflation) bond dedicated to transit, with additional funding approved by the Florida Legislature for transit which, up until that time, operated solely on fare revenue. In 1976, with preliminary engineering completed for the system, the Federal Transit Administration (FTA, then, the Urban Mass Transit Administration) committed 80% of the costs for the first stage of rapid transit system, with the county and state incurring the remaining cost. In the end the system cost over a billion dollars. In April 1979, the Interstate Commerce Commission ratified an agreement between the Florida East Coast Railway and Dade County to transfer the right-of-way along US 1 to Miami-Dade Transit, then named the Metro Transit Agency. Groundbreaking for the system the county commission voted to be named "Metrorail" (working name was DART - Dade Area Rapid Transit) took place at the site of what would become University station in June. Construction began in December 1980 with placing of a double-tee guideway girder near the University of Miami. The entire original 21 mi (34 km) line contained 2,704 girders, constructed at a cost of $55,887,830. In June 1983, the first segment of Metrorail, 10 stations from Dadeland South to Overtown (now "Historic Overtown/Lyric Theatre") was completed with the construction of the Miami River Bridge. Revenue operation commenced on May 20, 1984, with 125,000 taking the free first-day service from Pinecrest/Dadeland to Overtown. In 1984 Rockne Krebs created an urban-scale neon sculpture multicolored light installation called The Miami Line that stretches 1,540 feet (470 m) across the Metrorail bridge over the Miami River. Additional segments between Earlington Heights and Okeechobee opened between December 1984 and May 1985. In March 1989, a temporary station was opened to provide a connection to the newly opened Tri-Rail commuter rail line, with the now permanent station officially opening in June. Preliminary engineering for a rapid transit extension to the Palmetto Expressway began in 1996 with Palmetto station opening in May 2003. As far as operational costs, revenues expected for 2006 were $17.15 million, while expenses budgeted for 2006 were $41.29 million. These historic figures became the last the Miami Dade Transit Authority ever disclosed, and are the figures still displayed on today's Miami-Dade Transit webpage as of January 2012. With the area having a generally low density and lacking transit-oriented development, the Metrorail was designed as a park and ride system, with the idea being that suburban residents would drive to the stations, then commute the rest of the way into the city. Nearly all of the stations outside of downtown Miami have parking facilities, except Tri-Rail station. Several have large parking garages, such as Dadeland North and South stations, located at the southern end of the system, which combined have space for over 3,000 cars. Earlington Heights, located just northwest of Downtown and adjacent to Interstate 95 and the Airport Expressway, has a large garage that was formerly dedicated to Metrorail riders. However, that is now used by the county due to the station's low ridership, with only 95 vehicle spaces currently available. The successful Dadeland garages are at or over capacity, with two of Metrorail's proposed extensions, the West Kendall Corridor and South Link, intended to help alleviate them. The two northernmost stations, which are located near the Palmetto Expressway, Palmetto and Okeechobee, appeal to Broward County commuters with nearly 2,000 combined spaces. Additionally, the proposed North Corridor to the Broward/Miami-Dade county line would have included five park and ride facilities totaling 2,650 spaces. In the late 1990s, the plan was to potentially even continue the Metrorail line into Broward County along 27th Avenue (University Drive), ending at Broward Boulevard near Broward Mall in Plantation. With the growth of Miami, Miami-Dade Transit ridership increased to an all-time high during the real estate bubble of the 2000s, and again in the 2010s. After the initial segment of the single Green Line opened, Metrorail saw less than 10,000 riders per day. This increased to 15,000 after the rest of the line and stations opened in late 1984 and 1985. After running out of money due to cost overruns, the originally planned to be 50 miles (80 km) system consisting of several lines was never completed, and lack of transit-oriented development along the single line led to the system being regarded as a boondoggle. President Ronald Reagan commented that, given the low number of riders, it would have been cheaper to buy them all a limousine than the billion dollar cost of building and subsidizing the system. The federal subsidy was approximately $800 million of the $1.02 billion used to fund the line. Ridership was up to 15,000 after the rest of the line had opened. Ridership continued to grow in the late 1980s, with an edge city-like area known as Dadeland in suburban Kendall growing up around the southern terminus of the line at Dadeland North and Dadeland South stations. Consequently, the southern nine stations from Kendall to Downtown Miami have higher ridership than the northern end. This part of the system also has a higher average speed, having fewer curves and long distances between stations as it follows the congested South Dixie Highway. During the 1990s, ridership growth was relatively stagnant, however, and Metrorail remained the subject of criticism. At this time, ridership was up to about 50,000 per day, about a quarter of the original ridership estimate. Although the original referendum for a one-cent transit sales tax increase had failed in 1999, a half-cent sales surtax (Charter County Transit System Surtax) increase was passed by a two-to-one margin by Miami-Dade County voters in November 2002, with the intention being for the revenue to go fully towards the funding of new transit lines, including the Metrorail Orange Line, new bus routes, and increased service. Metrorail briefly ran a 24-hour hourly service from 12am to 5am and rush hour peak headways were reduced to 6 minutes, but the idea of the transit tax was sold to voters as being able to fund up to 88.9 miles (143.1 km) of additional Metrorail track by the 2030 long range plan, beginning with a completion of an Orange Line north corridor and east–west line by 2016. As it turned out, Miami-Dade Transit was running a deficit and used some of the tax to close the books, as well as using some to hire new staff, pay rent, and buy furniture for their new headquarters at the Historic Overtown/Lyric Theatre station. By the late 2000s recession, it was realized that only the 2.4-mile (3.9 km) AirportLink of the Orange Line would be funded, and after service cuts in 2008, Metrorail was running fewer trains than before the tax was passed. In response to all this, The Miami Herald published a comprehensive exposé titled "Taken For A Ride, How the transit tax went off track", detailing all of the promises that were not kept as well as what money was misspent and how. Despite the service cuts, due to the rise in energy prices and ever-increasing congestion, as well as a significant amount of residential development in the downtown area, ridership continued to grow during the 2000s, averaging well over 60,000 weekday riders throughout 2011. However, this is still short of the 1985 estimate of 75,000 daily riders that were expected by the end of that year. The transit tax also funded improvements to the adjoining Metromover system, including removal of the 25 cent fare, with the idea that higher ridership on the system would lead to higher Metrorail ridership, as well as the realization that the cost of fare collection exceeded fare revenue. The original Metrorail line was initially planned to be built to the airport, but due to political pressure and lobbying was instead directed to its current alignment around the airport and to Hialeah. In May 2009, Miami-Dade County broke ground on the AirportLink project, a 2.4-mile (3.9 km) extension of Metrorail connecting the existing Earlington Heights station to the Miami Intermodal Center (MIC), located adjacent to Miami International Airport's rental car center. The AirportLink was considered a vital component of the People's Transportation Plan (PTP), which Miami-Dade voters approved in 2002. The bulk of the funding for the $506 million project came from the plan's half-penny tax, with the Florida Department of Transportation (FDOT) contributing $101.3 million. Construction commenced in May 2009 and service began on July 28, 2012. Guideway along State Road 112 (Airport Expressway) under construction in late 2011. The AirportLink provides a fast, reliable Metrorail connection to MIA for the millions of residents, visitors and employees who travel to and from MIA every year. With this project, Miami-Dade County has joined the ranks of major metropolitan areas around the world with rapid transit connections to their airports. With the opening of the extension, a new Orange Line was launched, running concurrently with the Green Line from Dadeland South to Earlington Heights, and then running along the new extension to Miami Intermodal Center (MIC), a centralized transportation hub developed by FDOT that serves Metrobus, Metrorail, Tri-Rail, Greyhound Lines, and is proposed to serve Amtrak's Silver Service in the future. It also connects with the MIA Mover, an automated people mover which runs directly into the central terminal of the airport. Miami International Airport has over 35 million annual passengers is the county's largest employer. The MIC is projected to eventually attract 7,500 daily passengers to Metrorail. The project was completed on time and under budget. In addition to private development, several joint-development affordable housing projects have recently been constructed along the Metrorail line with the intent of increasing ridership through transit-oriented development. These projects include Santa Clara apartments, Brownsville Transit Village, and The Beacon, which is located near Historic Overtown/Lyric Theater station in Downtown Miami. The headquarters of Miami-Dade Transit, also located next to Historic Overtown/Lyric Theater station, is known as the Overtown Transit Village. Brownsville Transit Village, opening in March 2012, was visited by the administrator of the Environmental Protection Agency (EPA), Lisa P. Jackson, on January 5, 2012, to tour the 490-unit development, which will save an estimated five million gallons of water and $50,000 annually in utility bills due to environmentally sustainable plumbing fixtures. Nonetheless, by 2016, Brownsville and Santa Clara were still the lowest ridership stations, the only ones to regularly post ridership numbers below 1,000 daily. In general, stations to the north of Civic Center see much lower ridership, on average one-third of stations from Civic Center south. They are mostly in industrial areas with low population density and little development, as well as stagnant or declining populations, such as Gladeview and Brownsville. Additionally, stations to the north of Earlington Heights are only served by one line, giving them much longer headways. Metrorail runs from the northwest in Medley through Hialeah, into the city of Miami, the downtown area, through Coral Gables and South Miami, and ending in southwest Miami-Dade at Dadeland Mall. There are 23 accessible Metrorail stations, one about every 1.25 mi (2.012 km). Metrorail connects to the Metromover system at Government Center and Brickell stations and to South Florida's Tri-Rail suburban commuter rail system at the Tri-Rail station (see below). Since completion of the Airport Link in 2012, Metrorail increased its service frequency to peak headways of three and a half to five minutes on the shared portion of the line from Dadeland South to Earlington Heights. Along the Metrorail system, the tracks are mostly elevated. The three sections that are not are under I-95 between Vizcaya and Brickell stations, under I-95 just east of Culmer station, and the northern end of the line from just east of the Palmetto Expressway heading west into the Palmetto station and tail track. In each of these cases, the tracks ride on ground level for a brief amount of time. The platform at each Metrorail station is long enough to accommodate six-car-long trains; the Dadeland North, Earlington Heights, and Government Center station platforms are long enough to accommodate eight-car-long trains. In-service trains are usually either four or six cars long; in the evening it is not uncommon for Miami-Dade Transit to link two out-of-service trains together before returning them to Lehman Yard. Trains are stored at the Lehman Yard just west of Okeechobee station. There are extra tracks and a new test track, known as the Lehman Center Test Track, built at the Lehman Yard. Metrorail uses 136 heavy-rail cars (known as the Universal Transit Vehicle) built by the Budd Company under the name "Transit America"; they are identical to those used on the Baltimore Metro SubwayLink (save for the modifications made to Baltimore's cars during their refurbishment between 2002 and 2005), as the two systems were built at the same time, and the two agencies were able to save money by sharing a single order. The Baltimore-Miami order was among the last orders Budd filled before shuttering its railcar manufacturing business; a fleet of similar vehicles was manufactured for the Red and Purple lines of the Los Angeles Metro Rail between 1988 and 2000. These cars were manufactured in Budd's Red Lion plant in Northeast Philadelphia in 1983. The cars are 75 feet (23 m) long, 10 feet (3.0 m) wide and have a top design speed of over 70 mph (110 km/h). They are semi-permanently attached in married pairs, and joined up to form 4-car trains, which is the normal train length. Each car can hold up to 166 passengers (76 seated, 90 standing), and draw power from an electric 700 volt third rail. The Miami-Dade County Government was working with the Citizens Independent Transportation Trust (CITT) to receive money from the half-penny sur-tax approved by voters in 2002 in order to purchase new Metrorail cars. MDT later planned to refurbish the existing Metrorail cars with the money instead of replacing them as promised. However, it was found that the fleet had never been maintained properly, and in 2008, a cost-benefit analysis found that, based on the current fleet's condition, a refurbishment would cost just as much as it would to buy new cars, if not more so. The following year, Miami-Dade issued an RFP for new cars to replace their existing fleet, at a cost no greater than $2.419 million per car. Proposals from three railcar manufacturers were reviewed, with only two of which meeting the price requirements, these being from Italy-based AnsaldoBreda and Elmira Heights, New York-based CAF USA, an American branch of the Spain-based Construcciones y Auxiliar de Ferrocarriles. CAF's bid was slightly higher than that of AnsaldoBreda, and thus Miami-Dade was prepared to award the contract to the former. However, the contract was stalled when CAF filed a lawsuit against the transit authority, claiming that their selection of AnsladoBreda was due to the fact that the builder was willing to open a local factory in Miami-Dade County to assemble the vehicles. This violation could render the deal ineligible for federal funding. After reevaluating the bids from the builders, without taking local geographic preference into account, Miami-Dade reaffirmed its selection of AnsaldoBreda, and in November 2012, approved a $313 million purchase of 136 new Metrorail cars from the company. Miami-Dade issued the notice to proceed the following month, with the cars expected to be delivered over the course of several years until 2017. By the time the custom rail-car building facility in Medley was completed in early 2016, AnsaldoBreda had been purchased by Hitachi Rail and the full rollout was pushed back to 2019, beginning gradually from 2017. The first trainset entered service in early December 2017. The delivery of the cars fell behind schedule once again due to flooding at the Hitachi Rail factory in West Plains, Missouri, and in February 2018 it was announced that the final replacement cars would not arrive before 2020. The shortage of replacement cars resulted in some Metrorail runs being operated as two-car trains. A busy bike and ride rack at Brickell station. Some stations have bike lockers; bicycles are also allowed on the trains. As of October 1, 2013, the current standard fare on Metrorail is $2.25 and reduced fare is $1.10. A standard monthly pass costs $112.50 and $56.25 for reduced fare. The monthly Easy Cards are sold at over 50 sales outlets. Reduced fares are available only to Medicare recipients, people with disabilities, and Miami-Dade students in grades 1 through 12. No charge to kids below 42 inches (110 cm) tall when accompanied by fare-paying rider; limit 3. Ticket vending machines (TVMs) that sell Easy Cards and Easy Tickets are found in all rail stations. All Miami-Dade senior citizens aged 65 years and older and with Social Security benefits, and veterans residing in Miami-Dade and earning less than $22,000 annually ride free with the reduced fare monthly Easy Card. All of the stations except the five in the downtown area and Tri-Rail station have dedicated parking available. Parking costs $4.50 per day or $11.50 for a monthly pass. On July 16, 2008, Miami-Dade Transit announced that it would be replacing all fare collection methods with the Easy Card system by late 2009. The system replaces the old cash and token-based system with one that automatically deducts fares at Metrorail fare gates from a reloadable card. The final station to start fare gate installation was Government Center on August 2, 2009. Since the system launch on October 1, 2009, all passengers using Metrorail must use either an Easy Card or Easy Ticket to enter stations. For almost the full first year of use, the Easy Card ticket vending machines allowed anyone to purchase thousands of dollars worth of Easy Cards by credit card without entering a PIN or billing zip code, which led to credit card thieves putting high dollar values on Easy Cards and selling them at a discounted rate for cash. Miami-Dade Transit initially mitigated this issue by limiting credit card transactions to three per day and a value limit of $112, and later by requiring zip code verification for all cards. From 2009 to 2011, free Wi-Fi was added to Metrorail and Metromover cars and stations, as well as certain Metrobus routes. Starting July 28, 2012, Metrorail increased service along shared Green and Orange Line stations from Dadeland South to Earlington Heights. Along this stretch of shared track, trains arrive every 5 minutes during peak hours, every 7 minutes during mid-day hours, and every 15 minutes late nights and on weekends. At stations with only one service, trains arrive every 10 minutes during weekday rush hours, every 15 minutes at midday, and every 15–30 minutes after 6 p.m. until midnight with weekend service running every 30 minutes. Metrorail runs from 5 a.m. until midnight seven days a week. For a brief period from 2003 to April 2004 there was 24-hour service supported by the transit tax; between midnight and 5 a.m. trains arrived every 60 minutes. A limited-stop bus route, Route 500 Midnight Owl, operates hourly between 12:30 a.m. and 5:30 a.m. trip between Dadeland South and Government Center Metrorail stations. This bus service replaces the 24-hour Metrorail service cancelled due to a lack of ridership. Construction on the first segment of the Orange Line, Metrorail's AirportLink began in May 2009; service to Miami International Airport began in the summer of 2012. In December 2015, Miami-Dade Transit initiated a monthlong pilot program for express service between key stations during rush hours. During morning rush, many stations are skipped from the north and south en route to downtown, and in the afternoon, stations are skipped as the trains leave downtown. The service was well received, though it only saved a few minutes' time, partially due to the headway limitations with a system only having two tracks. The service continued past December. The MetroPath bridge over the entrance to the Snapper Creek Expressway opened in 2011. The 2011 Metro-Path extension running along the track guideway near Dadeland South station. Beneath the Metrorail guideway from Brickell to Dadeland South, along the former Florida East Coast Railway right-of-way, there is a nearly contiguous 10.5 mi (17 km) bicycle and pedestrian trail known as the MetroPath (M-Path) which was built in 1984 along with the metro system. It is popular among cyclists, some of whom use it to commute to and from downtown, as well as runners. In late 2011, the MetroPath was extended and a 200 ft (61 m) bridge was added over the freeway style entrance to the Snapper Creek Expressway (S.R. 878) near Dadeland North station to complete the M-Path with the exception of a few small breaks at major road crossings such as near the north end at Coral Way (SW 13 Street) in Brickell and the Douglas Road area around Bird Road in Coral Gables. Beyond Dadeland South, the M-Path connects with the 20.5 mi (33 km) South Dade Rail Trail, which runs along the South Dade rapid transit busway, also former FEC right of way, all the way to Florida City. Together, the two paths form a continuous 31 mi (50 km) off-road trail for pedestrians and cyclists. Both trails are part of the ambitious East Coast Greenway project. Many additional improvement projects are planned over the coming years as part of the Metropath Master Plan created in 2007, such as repaving, widening, and enhancing crosswalks at major intersections. As of 2014, there are plans to revamp the MetroPath as a linear park, taking after the popular Highline Park in New York City, by a group known as "Friends of the GreenLink. The University of Miami assisted in the procurement of the idea. Into 2015, the proposal gained momentum and rebranded itself as [Friends of] "The Underline". Actual design work was done by James Corner, and the project was recognized by the county. Schematic of rapid transit and passenger rail service in the Miami metropolitan area in 2017. The Tri-Rail Downtown Miami Link is scheduled to be operational in 2019. Metrorail currently operates 23 stations, and combined with the Metromover in Downtown Miami and Brickell, the entire Metro system operates 43 stations. Metrorail stations are located at about a mile (one and a half kilometer) apart along the line, and Metromover stations are located at approximately every two blocks in the greater Downtown area. Travel times provided are approximate for travel to and from Government Center in Downtown. A pilot express service was added in December 2015 for morning and afternoon trains to skip stops to and from downtown, respectively. During rush hours, express trains run between Dadeland South and Government Center in the peak direction, making intermediate stops at Dadeland North and Brickell. The unused east-west platform at Government Center, built in 1984 with the existing system, but never completed. One variation of the Orange Line extensions was for a continuation past the current airport station instead of the 1984 ghost platform at Government Center. The 13.6 mi (21.9 km) Biscayne/Northeast Corridor following U.S. Route 1 (Biscayne Boulevard) from Government Center up to the Broward/Miami-Dade county line in Aventura. The 9.5 mi (15.3 km) North Corridor up NW 27 Avenue to the county line. The 17.2 mi (27.7 km) East–West Corridor from Government Center west to the Florida International University main campus in University Park, as well as east from Government Center to the Port of Miami. The 5.1 mi (8.2 km) BayLink from Historic Overtown/Lyric Theater station to South Beach, Miami Beach. The South Link, a 21 mi (34 km) extension of the Green Line from Dadeland South to Florida City. The 4.5 mi (7.2 km) Douglas Road extension from Douglas Road station to the Miami Intermodal Center. The 15 mi (24 km) (West) Kendall Corridor down Kendall Drive from Dadeland North station west to West Kendall and north to the FIU main campus. It was not until the half-penny transit tax was passed in 2002 that any serious expansion plans were again considered, with the North Corridor and East–West lines, both dubbed the "Orange Line," assuming the highest priority, while the possibility of 88.9 miles (143.1 km) of additional rail if all the extensions were built by 2030, was touted. However, after budget deficits, other uses of the tax revenue, and a downgrade of the North Corridor's funding priority to medium-low by the federal government, after 10 years only the 2.4 mile AirportLink and Orange Line remained promised and realized. The credibility of Miami-Dade Transit and the County as a whole, including the validity of their ridership estimates and revenue forecasts, has been a significant impediment to their qualifications for funding under the Federal Transit Administration's (FTA) approval. In 2011, Miami-Dade Transit underwent a serious federal investigation and takeover by the FTA in which it was forced to open its books over suspicions of money mismanagement. The Agency threatened to cease its funding used to cover operational costs, which would have meant significant cuts in service; however, they took the funding under their strict control to prevent this from happening. The South Link expansion, which was intended to replace the South Miami-Dade Busway, a bus rapid transit that opened in segments on February 3, 1997 and in April 2005, has plans for a widened right of way, elevated crossings at major intersections, as well as the possibility of building one additional Metrorail station at SW 104 Street to alleviate traffic and parking in Dadeland. Since 2009, the Metropolitan Planning Organization has proposed that the busway be opened to regular vehicle traffic by adding a SunPass toll system with the profits going towards busway improvements. Sortable chart detailing monthly weekday ridership averages by calendar year; right hand chart giving annual averages may use "fiscal year" without disclosure, where the FY begins in October and has 75% of its time in the next year with only 25% in the starting year. Note the large jump in ridership starting September 2012 after the Orange Line extension to MIA opened, the largest project that came to fruition after the passing of the half-penny tax in 2002. Service frequency below Earlington Heights was doubled as a result, hence the ridership jumped by nearly 10,000, at least four times the ridership of the single new station at the Miami Intermodal Center (< 2,000). Year averages are rounded to the nearest 500, and the highest month is also given in bold. A trend of lower ridership during the summer can be seen, when the traffic and population of the county (and state) is generally lower. The low December ridership anomaly may be explained by the long Christmas and holiday season. By 2016, ridership started to decrease, especially by summer, where July saw the lowest ridership since the Orange Line opened in 2012. This lag follows Metrobus, which began to decline in 2014, amid an aging fleet and falling oil and gas prices, and posted the lowest ridership numbers in over a decade during June and July 2016. For October 2016, even Metromover recorded low ridership, though the low numbers for this specific month were blamed on one day of closure for Hurricane Matthew. 2017 saw a continuation in the ridership decline across all three systems; ridership in September 2017 was impacted by Hurricane Irma despite the exclusion of days without service from the average. ^ *Where the Green and Orange lines run together. No service from approximately 12 a.m. to 5 a.m.
^ "Ridership Technical Report" (pdf). Miami-Dade County. September 2018. Retrieved December 2, 2018. ^ "Miami-Dade Ridership Report - Q1 2018 Report" (pdf). Miami-Dade County. April 1, 2018. Retrieved July 1, 2018. ^ Ltd, White October. "Miami Dade County | Hitachi Rail Europe". italy.hitachirail.com. Retrieved January 2, 2018. ^ a b Metro staff (August 2010). "Miami airport extension progressing". Metro Magazine. Retrieved January 3, 2012. ^ a b "AirportLink". Miami-Dade County. 2011. Archived from the original on January 9, 2016. Retrieved January 5, 2012. ^ "Zero Void ® Monostrand System Stabilizes Modern Transportation Hub at Miami Airport". DYWIDAG-Systems International. Archived from the original on March 16, 2012. Retrieved January 5, 2012. ^ "History 1970s". Miami-Dade County. Archived from the original on March 2, 2012. Retrieved January 16, 2012. ^ "Miami-Dade County Population Growth". CensusScope.org. Retrieved January 5, 2012. ^ a b c "Metrorail Facts". Miami-Dade County. Archived from the original on December 24, 2011. Retrieved December 27, 2011. ^ "So Why Is Fred Jones Smiling About Public Transport?". Lakeland Ledger. The New York Times Company. May 23, 1978. p. 2B. Retrieved November 23, 2015 – via Google Books. ^ "History 1980s". Miami-Dade County. Archived from the original on March 2, 2012. Retrieved January 14, 2012. ^ a b Holle, Gena. "Two of a Kind: Miami's Metrorail & Metromover" (PDF). Community Transportation Association. Retrieved January 14, 2012. ^ Gale, Kevin (August 24, 2011). "Tri Rail privatization studied as way to add FEC commuter service". South Florida Business Journal. Retrieved October 13, 2011. ^ "Dadeland North Metrorail Station". Miami-Dade County. Archived from the original on January 30, 2012. Retrieved January 15, 2012. ^ "Dadeland South Metrorail Station". Miami-Dade County. Archived from the original on January 30, 2012. Retrieved January 15, 2012. ^ "Earlington Heights Metrorail Station". Miami-Dade County. Archived from the original on January 6, 2012. Retrieved January 15, 2012. ^ a b c d e "Taken For A Ride". The Miami Herald. June 2009. Archived from the original on December 3, 2008. Retrieved January 12, 2012. ^ "Palmetto Metrorail Station". Miami-Dade County. Archived from the original on January 30, 2012. Retrieved January 15, 2012. ^ "Okeechobee Metrorail Station". Miami-Dade County. Archived from the original on January 30, 2012. Retrieved January 15, 2012. ^ a b c "North Corridor Metrorail Extension". Federal Transit Administration. November 2003. Archived from the original on May 28, 2010. Retrieved January 16, 2012. ^ Bradberry, Angela (February 19, 1996). "Metrorail Plan Would Link Broward, Dade". Sun Sentinel. Retrieved January 19, 2012. ^ a b c "Reagan Off Target On Metrorail". Sun Sentinel. March 6, 1985. Retrieved January 19, 2012. ^ "Let's expand Metrorail". Critical Miami. December 29, 2005. Retrieved January 14, 2012. ^ Frame, Clifford (March 16, 1998). "Bullet Train Lessons In Past Rail Projects". Sun Sentinel. Retrieved January 17, 2012. ^ Weaver, Jay; Schuster, Karla (July 17, 1999). "Penny-tax Ruling May Cost Billions". Sun Sentinel. Retrieved January 17, 2012. ^ a b "Memorandum" (PDF). Miami-Dade County. May 6, 2008. Archived from the original (PDF) on June 3, 2013. Retrieved January 19, 2012. ^ Miami Herald (2011). "As Gas Costs Climb, Ridership on Metrorail is Rising". Mass Transit Mag. Retrieved December 28, 2011. ^ "Ridership Technical Reports". Miami-Dade County. 2011. Archived from the original on December 15, 2011. Retrieved January 14, 2012. ^ Chardy, Alfonso (January 2, 2012). "Metrorail line to Miami International Airport almost complete". Miami Herald. Retrieved December 2, 2011. ^ "Miami Central Station (MCS)". MDAD (Miami International Airport). Retrieved January 14, 2012. ^ "Metrorail AirportLink". MICdot.com. Retrieved January 16, 2012. ^ "AirportLink Metrorail Extension Project". Miami-Dade County. November 2011. Archived from the original on December 28, 2011. Retrieved December 29, 2011. ^ "Joint Development Project - Brownsville". Miami-Dade County. Archived from the original on December 15, 2011. Retrieved January 14, 2012. ^ "EPA administrator to visit Miami project". The Miami Herald. January 4, 2012. Retrieved January 14, 2012. ^ "Ridership Technical Report (June 2016)" (PDF). Miami-Dade County. July 2016. Retrieved August 17, 2016. ^ a b c "Transit Development Plan" (PDF). Miami-Dade County. September 2011. Archived from the original (PDF) on December 15, 2011. Retrieved January 4, 2012. ^ a b "AirportLink construction brings Metrorail changes". Miami-Dade County. Retrieved January 16, 2012. ^ Susan Danseyar (August 16, 2016). "Test track two years late for 132 Metrorail cars". Miami Today. Retrieved December 6, 2016. ^ a b Brannigan, Martha; Chardy, Alfonso (November 29, 2011). "Feds: Miami-Dade broke rules in choosing new Metrorail trains". The Miami Herald. Retrieved January 4, 2012. ^ Scott M. Kozel (October 13, 2002). "Baltimore Metro Subway". Roads to the Future. Retrieved June 28, 2002. ^ "Community Image Advisory Board" (PDF). Miami-Dade County. March 26, 2008. Retrieved January 4, 2012. ^ Mazzei, Patricia (October 15, 2012). "Contract for new Metrorail cars moves forward". The Miami Herald. Retrieved November 25, 2012. ^ Mazzei, Patricia; Rabin, Charles (November 8, 2012). "Miami-Dade commissioners approve new Metrorail cars". The Miami Herald. Retrieved November 25, 2012. ^ "System Projects". Miami Dade County. July 19, 2013. Retrieved April 6, 2014. ^ Bowden, Marilyn (February 23, 2016). "Plant to assemble new fleet of Metrorail cars". Miami Today. Retrieved February 24, 2016. ^ "Miami-Dade County gets its first new Metrorail train for over 30 years". Intelligent Transport. December 4, 2017. Retrieved December 4, 2017. ^ Douglas Hanks (February 1, 2018). "Relief delayed: Metrorail falls behind schedule on replacing old trains". Miami Herald. Retrieved March 13, 2018. ^ "Metrorail Bike & Ride". Miami-Dade County. Retrieved February 16, 2014. ^ "Transit Fares". Miami-Dade County. Retrieved January 14, 2012. ^ "Metrorail Parking". Miami-Dade County. Archived from the original on January 30, 2012. Retrieved January 14, 2012. ^ "Miami-Dade Transit unveils EASY Card and Google Transit Trip Planner". Miami-Dade County. July 14, 2008. Retrieved January 5, 2012. ^ "Easy Does It!". Miami-Dade County. Archived from the original on January 9, 2016. Retrieved January 5, 2012. ^ "What is the Easy Card?" (PDF). Miami-Dade County. January 2009. Retrieved January 5, 2012. ^ "EASY Card". Miami-Dade County. Archived from the original on January 4, 2012. Retrieved January 14, 2012. ^ "I Team: Dade's Easy Card Becomes Easy Fraud". WFOR-TV. September 14, 2010. Retrieved January 5, 2012. ^ "Miami-Dade Metro Transit Commuters To Get Free Wi-Fi". WFOR-TV. February 23, 2011. Retrieved January 15, 2012. ^ "Hours of Operation". Miami-Dade County. Archived from the original on January 30, 2012. Retrieved January 15, 2012. 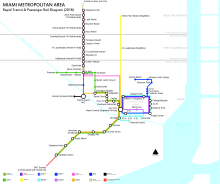 ^ "Miami Metrorail extension renamed AirportLink". Progressive Railroading. June 16, 2010. Retrieved January 5, 2012. ^ a b "Express Trains Now Run To Downtown Miami, Brickell". CBS Miami. December 7, 2015. Retrieved December 9, 2015. ^ Chardy, Alfonso (December 19, 2015). "Metrorail tries out a new express service to downtown". Retrieved February 20, 2016. ^ "Metrorail Downtown Express". Miami-Dade County. December 30, 2015. Retrieved February 20, 2016. ^ Bryant, Chuck (December 4, 2008). "The Asphalt Metro-Path That Runs Under The Metrorail". Run the Planet. Retrieved January 11, 2012. ^ "M-Path Extension Bicycle and Pedestrian Trail". Florida Department of Transportation. Archived from the original on February 11, 2012. Retrieved January 4, 2012. ^ "South Dade Trail". TrailLink.com. Retrieved January 9, 2012. ^ Garcia, Tony (January 4, 2012). "Cyclists to celebrate closing M-Path's Dadeland Gap". Transit Miami. Archived from the original on January 17, 2012. Retrieved January 4, 2012. ^ "Metrorail M-Path Master Plan" (PDF). Miami-Dade County MPO. July 2007. Retrieved May 8, 2012. ^ Robbins, John Charles (June 18, 2014). "Will Miami's Metrorail shade a linear park?". Miami Today. Retrieved November 28, 2014. ^ Robbins, John Charles (September 10, 2014). "10-mile linear park gets new look". Miami Today. Retrieved November 28, 2014. ^ "THE UNDERLINE". miamidade.gov. Miami-Dade County. November 10, 2015. Retrieved November 23, 2015. ^ "Route 500 Midnight Owl". Miami-Dade County. Retrieved January 14, 2012. ^ "Route 500 Midnight Owl (printable map)" (PDF). Miami-Dade County. Retrieved January 14, 2012. ^ "Ridership Technical Report (March 2018)" (PDF). Miami-Dade County. June 2018. Retrieved June 2, 2018. ^ "South Miami-Dade Busway". Miami-Dade County. Archived from the original on January 28, 2012. Retrieved January 15, 2012. ^ Chardy, Alfonso (September 29, 2011). "Plan would let drivers pay toll to use South Dade Busway". The Miami Herald. Archived from the original on October 25, 2011. Retrieved January 15, 2012. ^ a b "Ridership Technical Report (September 2017)" (PDF). Miami-Dade County. Retrieved January 2, 2018. ^ "Ridership Technical Report (October 2016)" (PDF). Miami-Dade County. Retrieved January 26, 2017. ^ a b Chardy, Alfonso (May 11, 2014). "Miami's Metrorail at 30: Promises kept, promises broken". The Miami Herald. Retrieved October 19, 2015. ^ "History 1990s". Miami-Dade County. Archived from the original on March 1, 2012. Retrieved January 5, 2012. Benjamin, Peter (January 1978). Draft Environmental Impact Statement Metropolitan Dade County Rail Rapid Transit Project. Washington, D.C.: US Department of Transportation / Urban Mass Transportation Administration. OCLC 3713000 – via WorldCat. Taylor, John K. (May 1978). Final Environmental Impact Statement Metropolitan Dade County Rail Rapid Transit Project. Washington, D.C.: US Department of Transportation / Urban Mass Transportation Administration. OCLC 3990731 – via WorldCat. This page was last edited on 23 April 2019, at 21:25 (UTC).